43 inches. 43 of of them. However did we used to manage with those 17-inch beige CRT lumps? (Just fine actually, when I think back to the days of 480p gaming and the numerous delights it held.) 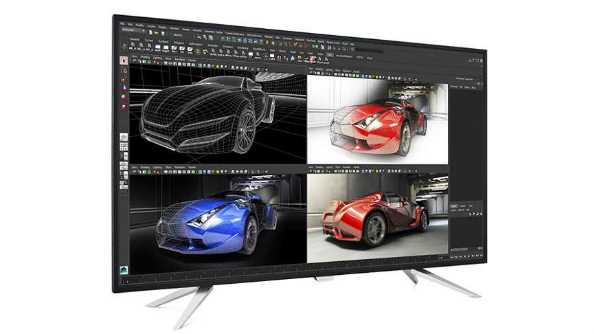 I digress – Philips are expanding their range of 4K IPS panels with the BDM4350UC, a 43-inch version of their existing 40-inch 4K IPS. Both are surprisingly affordable. Have screen space to spare, do you? Why not fill it with teenie-tiny battles from the best strategy games on PC? The BDM4350UC is a 60Hz IPS panel with a native resolution of 3840 x 2160 over a 43-inch screen. It makes sense to offer a 4K panel at a larger screen size than is currently customary in PC monitors, because the pixel density in 30-inch 4K panels and below can get a bit intense. With 103.64 pixels per inch (PPI), this larger Philips panel spreads the density out to a more comfortable degree. On the other hand, it makes less sense to produce a panel you’ll likely sit just a foot or two away from with TV-like dimensions. Is 43 inches too big for PC gaming? Having never tried it with such a big screen, I couldn’t make a call on it definitively. But it does seem to be stretching the limits of your peripheral vision at that range. The screen’s WLED backlit, and offers a 1200:1 contrast ratio and viewing angles of 178/178°. As for connections, it’s fitted with two Display port 1.2 connectors and 2 HDMI 2.0 ports. It’s fair to say this panel isn’t specced or marketed for PC gaming in particular – the 60hz refresh rate is evidence enough of that – but it’s a fairly attractive option if you tend to watch a lot of movies on your PC, play games using a controller, and wouldn’t mind creating some sort of PC/TV hybrid environment. Philips say it’ll release between May and June this year, and Guru 3D are reporting that it’ll cost 799 Euros. At first that seems awfully low for such a big screen, but the slightly smaller 40-inch BDM4065UC is available now for around 670 Euros, which seems to make the former’s pricing altogether plausible.